Even before you and your patient come face to face, iMedlogics™ gives you a comprehensive integrative health history analysis that guides your clinical decision making for optimal treatment outcomes. Using iMedLogics™ saves you time, money, and increases practice volume. 78% of a working diagnosis is made from a good health history. Imagine having a working diagnosis before you even see a patient for the first time without having to labor through piles of medical records. iMedLogics™ provides a Comprehensive Integrative Health History Analysis for your new patients. However, it doesn’t stop there. 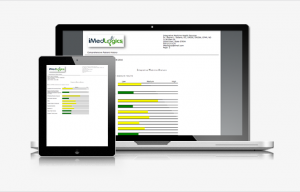 iMedLogics™ supports you throughout treatment of your patients with a multitude of tools that monitors patient progress to treatment and gathers information for follow up visits. Discover how iMedLogics™ allows you to see more patients, keeps you on schedule, improves doctor/patient relationships, patient compliance, and produces better treatment outcomes. This electronic questionnaire gathers an in depth patient health history and produces a comprehensive integrative medicine analysis, pointing to a working diagnosis. Includes 8 different clinical notes for patient management that are formulated for the program’s electronic patient file or downloaded for co-management. 5 interactive patient journals that monitor response to treatment. Gives a rating of suspected body system dysfunction/conditions in 18 categories. IMedLogics has taken measures to ensure that your patient information is secure on our servers. iMedLogics™ drives good doctor/patient relationships, which means higher patient compliance, successful treatment outcomes, and a higher referral rate.